I have for you some new Milani nail polishes for 2014. These are new to the Gold Label line and varied mix of cremes and fun glitter toppers! Power Perwinkle is a medium perwinkle creme. Showy Sea-green is a medium dusty green creme. Splendid Strawberry is a medium saturated warm pink creme. Vivid Violet is a saturated lavender creme. 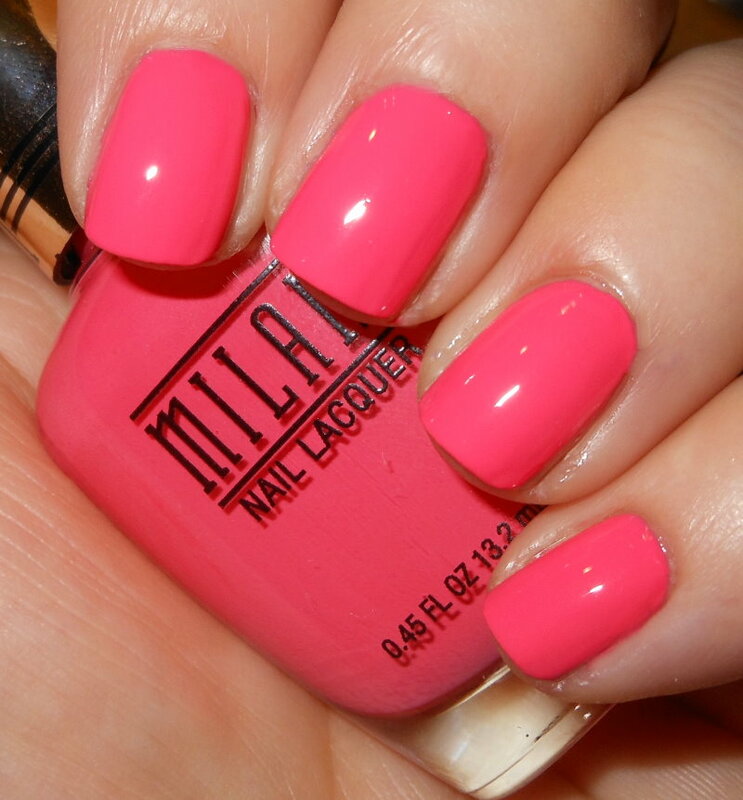 Popping Pink is a light-medium bubblegum pink creme. Colorful Coral is a medium coral creme. Color: This is a great mix of saturated pastel colors. These are exactly the colors that are on trend, and what I'll be reaching for in spring. It is great to see these made by a drugstore brand. Formula: I had a bit of difficultly with the formula on these. I'm actually thinking this has a lot to with the brush. The Gold Label Milanis have special flat/wide brushes. The brush is thick, as in it has significantly more bristles than other nail polish brushes. I think this causes the application to be streaky, and prevents the polish from leveling. I will be reviewing some new core line Milanis later that had the regular brush, and I did not have any application issues with those. That's why I'm thinking the brush maybe to blame. It's not terrible by any means, but it's noticeable in photos, I had some leveling issues. Top coat does help smooth it out a bit. Price: These are $4.49 and are available at CVS. Overall: I love the colors of these cremes. I love the price, and that these are a drugstore brand. The application/formula/brush issues I had are disappointing, but are not a deal breaker. Sugar High is a mix of pastel glitters, red, and gold glitters in a clear base. 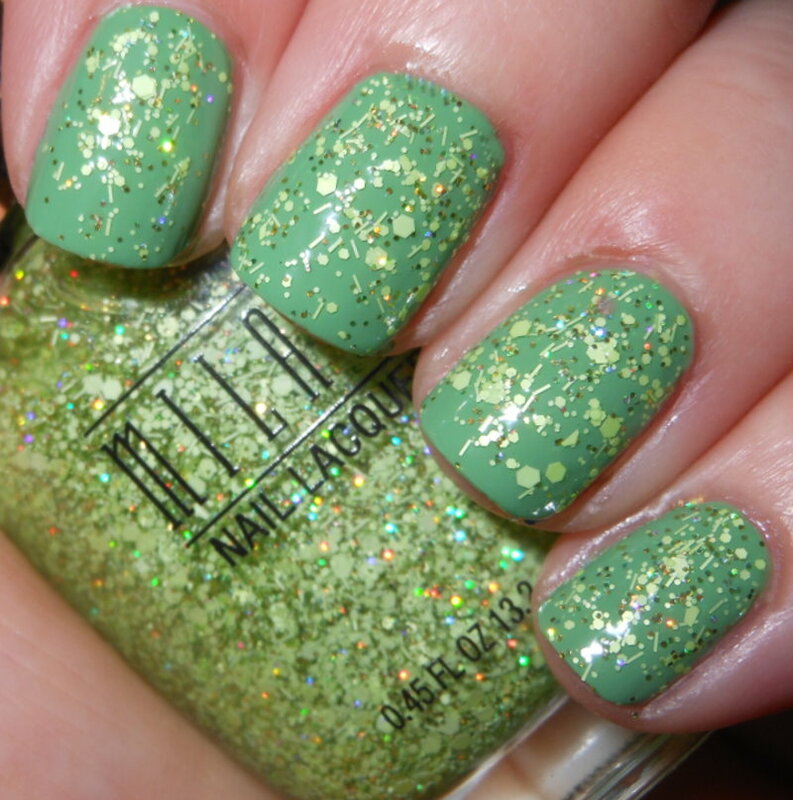 Sugar Coated is a mix of light green hex, bar, and green holo glitters in a clear base. Sugar Rush is a mix of white, orange, green, yellow, and gold glitters in a clear base. Sugar Cane is a mix of pink bar glitters, purple bar glitters,and white hex glitters in a clear base. Sugar Burst is a mix of pale pink bar, hex, and holo glitters in a clear base. Sugar Rim is a mix of blue, red, yellow, and black glitters in a clear base. 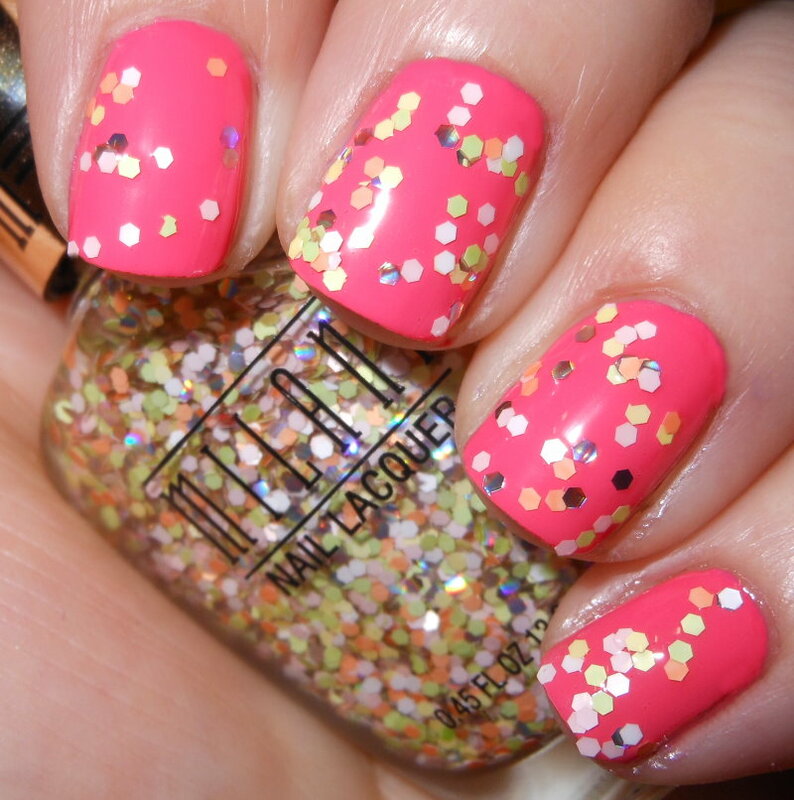 Color: I love these glitter toppers! I don't anything like these either on the mainstream nail polish market or drugstore. These definitely have an indie-esque feel to them. These are creative and fun glitter mixes. Formula: Formula on these was good, and I used 1 coat over the base for these. They are definitely buildable. I had the most difficulty with Sugar Cane, the bar glitters do stick together so it can be harder to spread. Price: These are $4.49 at CVS. Overall: I love these. I love the colors in them. I didn't have application issues, and I think these will look great over many many base colors! What a wonderful collection of colors and glitters! There perfect for the Spring! I love your glitter combos Steph great job!! The cremes & Sugar High are such amazing colors! Hope to get my hands on some of these! I need to get out and hunt some of these down. Gorgeous swatches! I love the glitters! They're fairly unique and so pretty! Wow, these are so spring-y and bright! I love Vivid Violet! I hope you can find them soon! Power Periwinkle, Splendid Strawberry, Vivid Violet are my favorites! Love Sugar Burst and Strawberry!